Efforts to provide safe water resources often are focused in developing countries, but the fact is nearly 2 million rural Americans do not have access to clean water. Such was the case in the Holly Ridge neighborhood in Candler, North Carolina, located outside of Asheville. The subdivision was developed in 1990 in three phases with four wells serving 29 lots. Over the years, the well houses and well equipment fell into severe disrepair, and the 24 households served by these wells – including 45 adults and 18 children – were left with poor quality water or no water at all. In January, Carol Gibson, president of the Holly Ridge Homeowners Association, contacted the Water Well Trust (WWT), a nonprofit arm of the Water Systems Council (WSC) established to provide wells for Americans who do not have a safe drinking water supply. Gibson told the WWT, “We can’t use the water to drink or cook. In response to the community’s water crisis, WWT’s Executive Director Margaret Martens and Susan O’Grady, Xylem Director of Marketing, Residential and Agriculture, joined forces to develop an effective and lasting solution for the subdivision’s water needs. Their combined industry experience and united cause gave rise to a plan that harnessed each organization’s resources for the largest project the WWT has undertaken to date. They enlisted local help from Merrill Drilling & Water Resources in Penrose and Hughes Supply in Statesville. Although the Holly Ridge Homeowners Association had attempted to maintain the neighborhood well systems over the years, limited finances and knowledge thwarted proper upkeep. Upon inspection, it was discovered the wells did not have a filtering system and pipes were not properly insulated to prevent freezing during the winter. The practice of pouring bleach down the pipes to disinfect the systems further harmed well components and sediment build-up contributed to poor water quality. “The homeowners attempted Band- Aid solutions over the last few years, purchasing pumps and tanks from retail stores that quickly failed because they weren’t meant to support that many houses and the setup wasn’t done properly,” O’Grady explained. 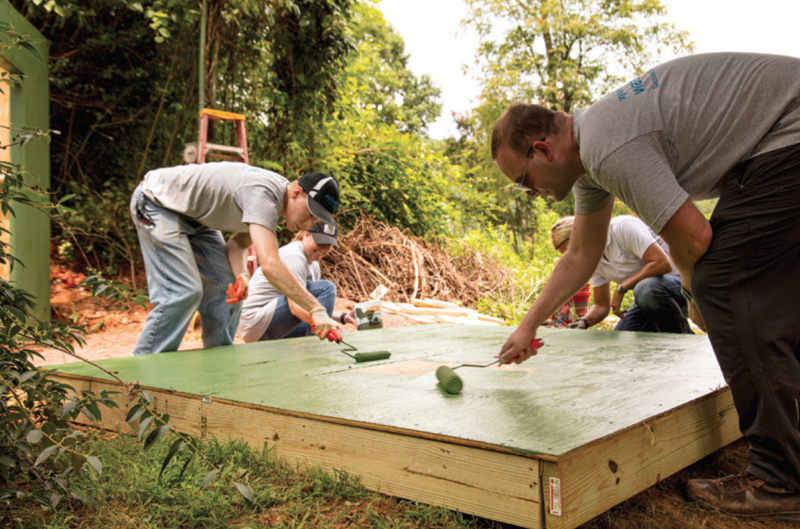 Volunteers from Xylem’s Charlotte office prepare the ground for construction of a new well house. Because the Holly Ridge neighborhood is located in a remote, hilly area, hooking into the municipal water supply would have been difficult and cost-prohibitive for homeowners. Martens said the cost-savings to homeowners in rural areas who drill a new well versus hooking up to a municipal water supply is estimated to be as much as 85 percent. Along with Xylem, Dustin Merrill, owner of Merrill Drilling & Water Resources, helped design and build the new water well systems. When water pressure issues proved complicated, Merrill and Chris Preston, Residential Water Product Manager, Xylem AWS, collaborated to troubleshoot system issues. “Multiple trips were made to the job site to uncover issues and determine the best path forward,” said O’Grady. In June, Merrill Drilling removed the existing water well systems, demolished the well houses and installed the new systems. Goulds Water Technology provided all of the materials for the project and supported the WWT with a $1,000 grant through Watermark, Xylem’s corporate citizenship program. Two wells were outfitted with 18GP2020 ProPak pumps and Aquavar Solo2 VFD controllers and V350 holding tanks. A 7GP2020 ProPak pump and VFD controller was installed on a third well along with a 1,000 gallon buried potable water storage cistern. Crews also laid down more than 1,000 feet of new piping and 2,000 feet of new electrical wiring. 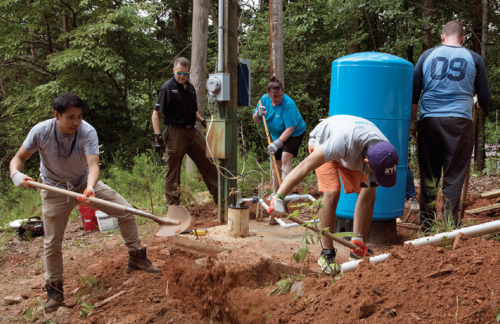 Hughes Supply, a Goulds Water Technology distributor in Statesville, North Carolina, coordinated the transport of the donated pumps and controls to the job site. Low well yield, which is typical of the Appalachian region, prompted the decision to install variable frequency drives (VFDs) and large holding tanks. Before the system was replaced, one of the Holly Ridge wells had been drilled nearly 600 feet deep, but only produced 2 gallons of water per minute. “It will be much easier to keep up with pressure demands with the variable speed drives in place,” said Merrill. In addition to consistent water pressure, the Aquavar Solo2 VFD controllers feature a dry well sensitivity setting, which detects dry well conditions and shuts down the system to prevent damage to the motor and pump. 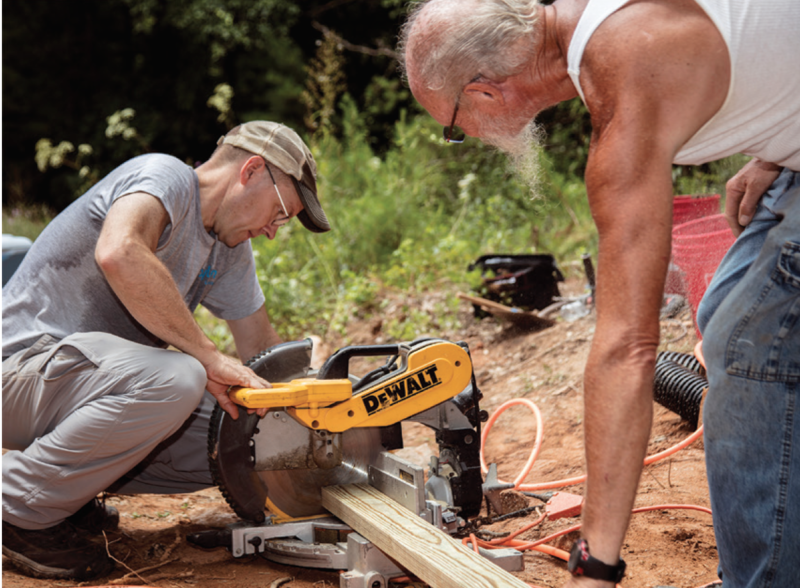 Volunteers cut wood to build the well house frame. 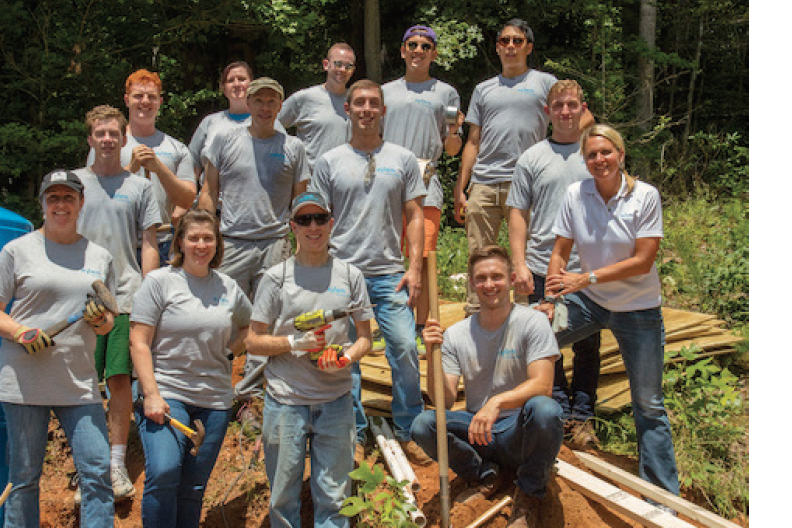 After the new well systems were installed, a group of volunteers from the Xylem office in Charlotte, North Carolina, partnered with Hughes Supply and Merrill Drilling in early July to build three new well houses through Xylem Watermark. Thanks to these combined efforts, Holly Ridge residents have safe water again. “Residents are grateful to be able to shower, to drink water and to bathe their children with clean water again,” said O’Grady. Design and build new water well systems, and provide materials for project including 18GP2020 ProPak pumps, Aquavar Solo2 VFD controllers, V350 holding tanks, 7GP2020 ProPak pump, 1,000 gallon potable water storage cistern, 1,000 feet of piping and 2,000 feet of electrical wiring.